In Penang, Tau Sar Piah (a.k.a. 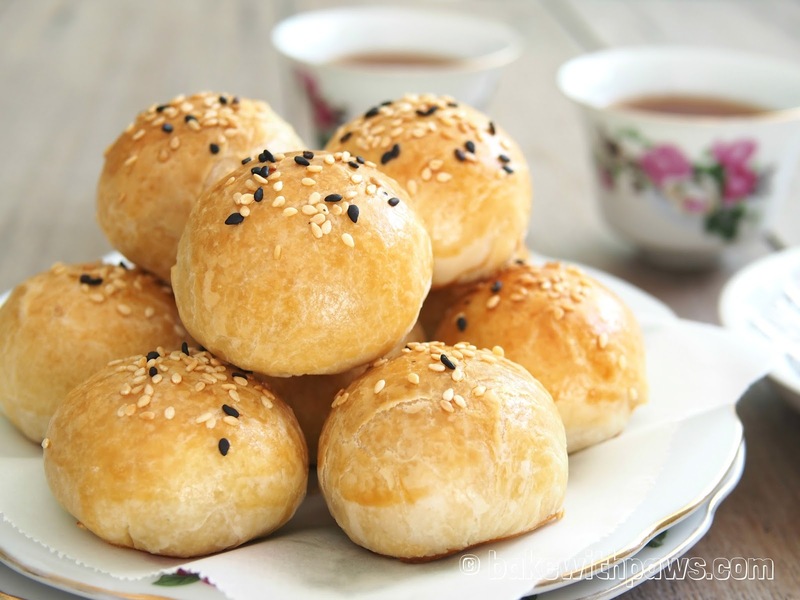 Tambun Biscuits) are baked flaky pastry biscuits filled with a sweet or savoury filling made from grounded mung beans (tau sar). We had a lot of mung beans left over from making bak chang by my mother in-law. So, I decided to use it to bake my healthy version of Tau Sar Piah where no shortening or pork lard used. Wash and soak mung beans in water for at least 4 hours or overnight. Drain well and steam at medium heat for 40 minutes till soft. In the meantime, fry the shallots with oil till fragrant and golden brown. Remove from wok and crash the fried shallot with spoon or hand. Set aside. Mash the steamed mung beans till very fine while still hot. Add brown sugar, salt, pepper and fried shallots (plus the oil) and mix well. 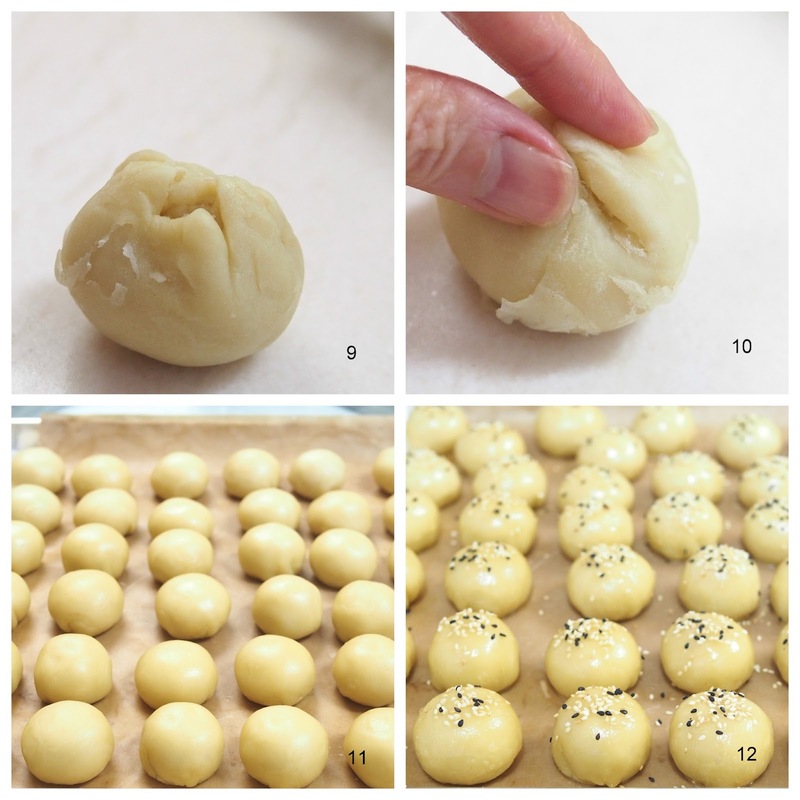 Divide the filling into 36 portions and shape into a ball (20g each ball). I did not stir fry as my steamed mung beans are very dried. If steamed water went in and made your mung beans very wet, then you need to stir fry at low heat till dry and you able to make shape into a ball. Knead ingredients (A) and ingredients (B) separately into a smooth dough by hand. Let them rest for 10 to 30 minutes. Divide the dough into 36 portions for each dough, around 12 g for water dough (A) and 7 g for oil dough (B). 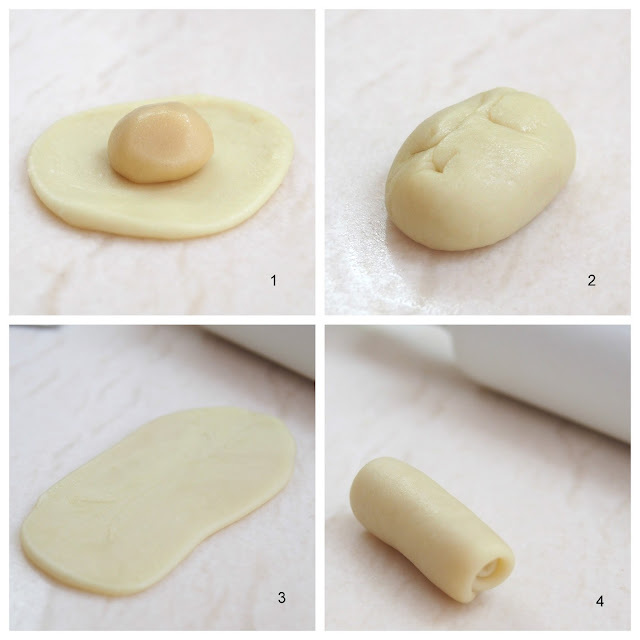 Flatten dough A and wrap up dough B. Roll skin into a rectangular shape, roll up like swiss roll. Repeat another time the same way. 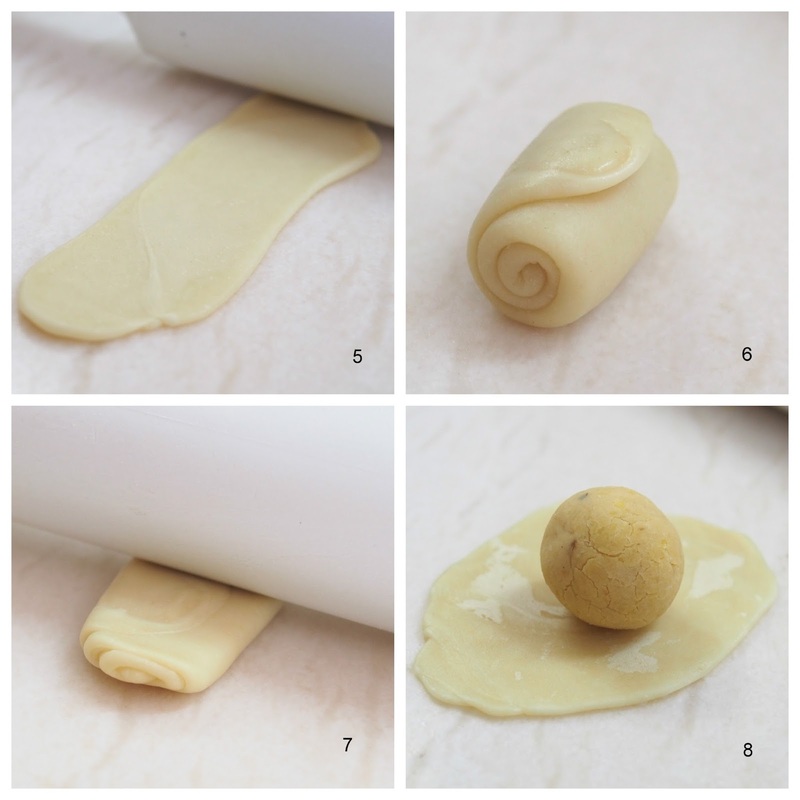 Roll skin into think rounds, wrap up 1 part of filling and form into a ball. Slightly flatten them and arrange onto a baking tray. 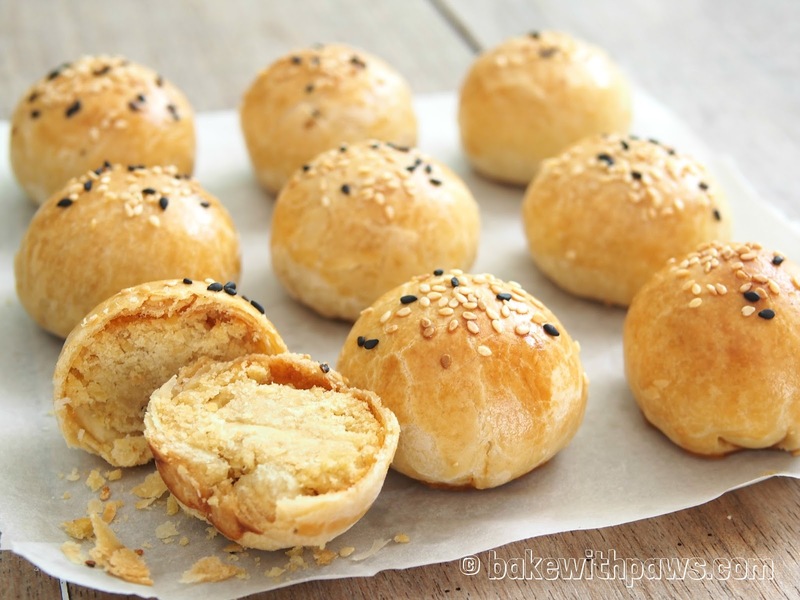 Brush with egg wash, leave till almost dry and brush again with egg wash.
Lastly sprinkle some sesame seeds on top. Bake in a preheated oven at 180C for around 30 minutes till golden brown.